Received July 5, 2018; Accepted August 2, 2018. The Jinsang 2 cultivar is a new late-maturing, low amylose rice variety with a medium to short culm created by the Seedpia Inc. breeding company in 2012. This variety was derived from a cross between Junam, a high-yield and lodging tolerant source, and DM3-8-72-9, which was derived from a cross between Donjinchal and Milkyqueen, with a low amylose content and superior agronomic traits. A general single seed descent method was applied to develop Jinsang 2 in the F3-F4 generations. During the F5-F8 generations, the breeding lines were selected through a pedigree breeding method. A promising line, JS6-B-52-8-3-5-1-B-B-B, was selected and named HJ-6 in 2011. This variety headed on the 25th of August, which was 14 days later than Hwayoung. The culm and panicle length of the variety was 71.6 cm and 19.9 cm, respectively. The milled rice from the variety had a dull and medium- to short-grain, and the 1,000-grain weight was around 20.0 g. It had a low amylose content of 12.2% and a low protein content of 6.8%. The yield performance of Jinsang 2 milled rice was about 5.36 MT/ha from the ordinary culture replicated yield trial test. 최근 들어 경제발전에 따라 소득이 증가되면서 소비자의 식문화가 고급화 및 다양화 되고 있는 추세이며, 이러한 사회적⋅경제적 변화와 더불어 국민 식생활이 바뀌면서 1인당 쌀 소비량은 지속적으로 감소하여 왔다(Ahn et al. 2015). 2008년 75.8 kg에서 2017년 60.4 kg으로 연평균 2.4% 감소하고 있으며, 앞으로도 쌀 생산량이 수요량을 초과하는 현상이 지속될 전망이다. 이러한 현상의 대안으로 쌀 산업의 안정적인 미래를 확보하기 위해서는 쌀품질의 고급화와 다양화를 통해 새로운 부가가치를 창출하는 노력이 필요하며, 소비자가 선호할 수 있는 품종 개발이 요구되어진다(Kang et al. 2008). 저아밀로스 품종은 외관이 반투명 또는 흐릿한 흰색으로 아밀로스 함량이 7~14% 정도이며, 메벼보다 전분의 점성이 강하고 팽화성이 높은 특성을 가지고 있어 식미향상을 위한 혼반용, 현미밥, 도시락용, 김밥, 가공밥 등 쌀소비 확대에 기여 할 수 있는 품종이다(Kim et al. 1999, Choi 2002). 쌀품질의 고급화와 차별화된 품종개발을 지속적으로 하여 국내에서는 ‘일품’의 저아밀로스 돌연변이인 ‘백진주’(Hong et al. 2012a)와 ‘백진주’의 특성을 개선한 ‘백진주 1호’(Hong et al. 2012b)가 개발되었고, ‘Milky queen’을 모본으로 활용한 조생종 ‘월백’, ‘설백’ 등이 개발되었으며(Won et al. 2012, Shin et al. 2012), 중생종 저아밀로스 품종인 ‘중생골드’ 등이 개발된 바 있다(Cho et al. 2013). 최근 ‘Koshihikari’의 waxy 돌연변이체인 ‘Milky queen’의 재배 및 가공판매가 증가하여 강원지역을 중심으로 확대되고 있지만 이 품종은 장간형 품종으로 도복에 약해 재배에 어려움이 있다(Ise et al. 2001). 이에 본 연구는 이러한 일본 도입 품종의 문제점과 쌀 산업의 안정을 위하여 준단간의 고품질 저아밀로스(아밀로스 함량 12.2%) 특성을 가지는 ‘진상2호’를 육성하였기에 그 육성경위와 주요 농업적 특성에 대해 보고하고자 한다. 본 시험은 2011년부터 2012년까지 2년간 중서부평야 2개 지역에서 보통기 보비재배를 하여 대조품종 ‘화영’과 주요 농업 형질과 수량성에 대해 비교 검토하였다. 재배법은 농촌진흥청 표준재배법에 준하였고(RDA 2011a, RDA 2011b), 4월 20일에 파종하여 5월 21일에 30 × 15 cm의 재식거리로 이앙하였고, 시비량은 N-P-K = 9-4.5-5.7 kg/10a로 시비하였다. 제초제는 초기제초제 5월 17일, 중기제초제 6월 1일에 살포하였고, 살균살충제는 이앙 당일 살균살충 입제를 살포하고, 8월 5일에 살충제와 살균제를 함께 살포하였다. 시험 구 표본 채취는 1반복당 30주로 3반복씩 수확하였고, 시험구 배치는 난괴법 3반복으로 하였다. 출수 50일 후에 수확하여 탈곡 후 수분 함량을 15% 이하로 자연 건조하여 실험실용 현미기(쌍용SY88-TH)로 제현 후, 사미, 피해립 등을 제거한 현미를 곱게 갈아서 80 메쉬(Mesh)의 채로 처리하여 이용하였다. 아밀로스 분석은 100 ㎎의 현미 가루에 95% 에탄올 1 mL와 1N 수산화나트륨(NaOH) 9 mL를 가해 끓는 물속에 10분 동안 호화시킨 후 100 mL이 되도록 증류수를 첨가하였다. 상기 용액 중 5 mL를 취해 1N 아세트산 1 mL와 2% 요오드-요오드화 칼륨 용액(I2-KI solution) 2 mL를 가해 증류수를 첨가하여 100 mL로 만든 후 발색 반응시켜 620 ㎚의 파장에서 분광 광도계(spectrophotometer)로 읽어 흡광도를 측정하여 계산하였다. DNA 다형성 분석을 위해 신품종 진상 2호와 교배모본으로 활용된 화영, 주남, 동진찰, 밀키퀸을 포함하여, 기 육성된 중간찰벼 품종인 월백(Won et al. 2012), 중생골드(Cho et al. 2012), 백진주(Hong et al. 2012a), 백진주1호(Hong et al. 2012b), 진상(Hong et al. 2014)벼를 공시 하였다. DNA추출은 각 종자를 파종 후 20일경 어린잎을 따서 NucleoSpin® Plant Ⅱ kit (MACHEREY-NAGEL, Germany)를 이용하여 추출하였다. 추출된 DNA는 Nanodrop (Thermo, USA) 으로 정량을 하여 10 ng/μL로 희석하여 사용하였고, 각 시료의 DNA 5 μL, 10x reaction buffer를 2 μL, 2.5 mM d-NTP 1.6 μL, SSR marker (forward + reverse) 2 μL, taq polymerase을 0.5U 혼합한 후 증류수로 총량을 20 μL로 맞추어 PCR을 진행하였다. PCR은 95°C 5 분간 충분히 denature 하고, 95°C 30초, 58°C 30초, 72°C 60초로 35 cycle을 반복하였다. Capillary 전기영동 기계인 QIAXEL (QIAGEN, USA)을 이용하여 PCR 산물의 크기를 측정하였다. 다형성 분석에는 RM21, RM48을 사용하였다(Hong et al. 2014). 벼 신품종 ‘진상2호’는 고품질 및 재배안전성이 우수한 중간찰 품종 육성을 위해 내도복 다수성 특성을 갖는 주남벼를 교배모본으로 선정하고, 중간찰 특성을 도입하기 위해 동진찰벼와 밀키퀸 교배 후대에서 중간찰 및 우수한 재배특성을 갖는 F3 계통(DM3-8-72-9)을 교배모본으로 선정하였다. 목적에 부합하는 계통을 선정하여 2003년 하계에 03년 하계에 내도복 다수성의 주남벼와 중간찰 특성을 보이는 DM3-8-72-9를 인공교배하여, 수확된 종자를 JS6으로 표기하여, 2004년에 F1 종자를 파종하였고, 2004년 동계부터 2005년 동계까지 1개체 1계통법으로 신속세대 진전을 수행하고, 2006년에 F6 세대에서 중간찰 특성의 개체를 선발하여, 2010년까지 매년 포장에서 계통재배하면서 중간찰 특성을 가지면서, 임성, 초형이 양호하며, 내도복 및 다수성을 갖는 JS6-B-52-8-3-5-1-B-B-B 계통을 선발, 고정하였다. 선발된 계통에 대해 ‘HJ-6’ 계통명을 부여하고, 2013년~2014년에 난괴법 3반복으로 생산력검정 및 농가실증시험을 수행한 결과 품종의 균일성과 재배안정성을 확인하여 ‘진상2호’ 라고 명명하였다(Figs. 1, 2). Genealogical diagram of ‘Jinsang 2’. Pedigree diagram of ‘Jinsang 2’. 신품종 ‘진상2호’의 출수기는 중서부평야 보통기 보비재배시 8월 25일로 대조품종인 ‘화영’ 보다 14일 늦은 만생종이다. 간장은 71.6 cm로 ‘화영’에 비해 6 cm 정도 짧고, 수장은 19.9 cm 주당수수는 14.6개로 ‘화영’과 비슷하나, 수당립수는 106.5개로 대조 품종보다 많고 현미천립중은 20.0 g으로 ‘화영’의 21.3보다 가벼웠다(Table 1). ‘진상2호’는 못자리 불시출수는 관찰되지 않았고, 도복성은 중강 수준이고, 성숙기 엽노화는 느린 편이며, 내냉성은 중 정도였다. 목도열병과 줄무늬잎마름병은 중강 정도의 저항성을 보였으나 흰잎마름병과 멸구에 대한 저항성은 없었다(Table 2). Response to physiological stress and Pest Resistance. ‘진상2호’의 정현비율은 77.1% 대조품종과 비슷한 수준이며 현미길이가 4.88 mm로 대조품종의 5.01 mm에 비해 짧고 폭과 두께는 각각 2.81 mm, 1.94 mm로 대조품종의 2.90 mm, 2.02 mm 비해 작지만 장폭비는 1.74 mm로 대조품종과 유사한 단원형 특성을 보였고, 등숙률은 90% 수준이며, 수량성은 536 kg/10a로 대조품종인 ‘화영’벼의 516 kg/10a보다 높았다(Table 3). Grain characteristics of ‘Jinsang 2’. ‘진상2호’는 중간찰벼로 배유는 중간정도의 불투명 특성을 보이고 알칼리 붕괴도는 ‘화영’과 비슷한 수준이며, 아밀로스 함량은 12.2%로 대조품종의 18.5%보다 낮고 도요 식미기로 측정한 밥윤기치는 86으로 대조 품종보다 높게 나타났다(Table 4, Fig. 3). Grain appearance (a): Rough rice-Hwayeongbyeo, (b): Rough rice- Jinsang 2, (c): Brown rice- Hwayeongbyeo, (d): Brown rice- Jinsang 2. DNA 다형성 검정을 위해 2개의 SSR marker (RM21, RM48) 를 이용하여 증폭된 DNA 단편을 QIAXEL (QIAGEN, USA) 를 이용하여 비교한 결과, ‘진상2호’는 현재 육성된 중간찰 특성을 가지는 벼 품종인 ‘월백’, ‘중생골드’, ‘백진주’, ‘진상’ 등과 구분이 가능하고, 모본으로 사용된 ‘주남벼’의 특성과 ‘동진찰벼’ 의 특성이 유전되었음을 알 수 있다. 즉, RM21, RM48의 2개 마커 조합을 이용할 경우 기존의 육성된 중간찰벼 품종과 구분이 가능하였고, ‘진상2호’는 RM21에서는 주남벼의 밴드패턴을, RM48에서는 동진찰의 밴드패턴을 보여 모본 및 부본의 특성을 보이는 것을 알 수 있다(Fig. 4). 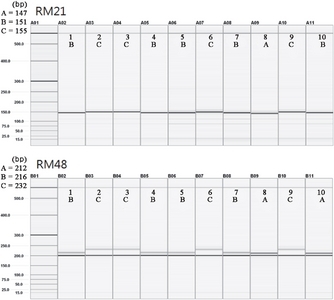 PCR Product patterns of 6 rice cultivars with low amylose content, ‘Jinsang 2’ and its parent amplified by RM21, RM48. 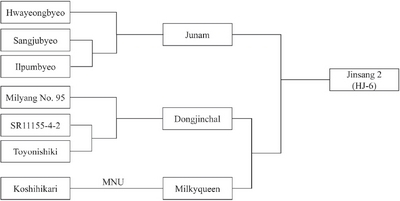 DNAs extracted from the cultivars (1) Hwayeong, (2) Wolbaek, (3) Jungsaeng gold, (4) Baegjinju1, (5) Baegjinju, (6) Jinsang, (7) Junam, (8) Dongjinchal, (9)Milkyqueen (10) Jinasang 2(HJ-6) were used as templates for PCR amplification. 본 결과물은 농림축산식품부의 재원으로 농림식품기술기획평가원의 고부가가치식품기술개발사업의 지원을 받아 연구되었음(115011-03-3-HD020). Ahn EK, Lee JH, Lee SB, Yang CI, Choi YH, Chang JK, Jeong JM, Lee GS, Kim MK, Kim JH, Hyun UJ, Mo YJ, Yoon YH, Jeung JU, Oh SK, Seo MW, and Kim CK. Late-maturing, high biomass and multiple disease resistant whole crop silage rice cultivar 'Jungmo1029'. Korean J Crop Sci 2015;47:159-165. Cho YC, Kim MK, Kim YG, Choi IS, Yang CI, Oh MG, Lee JH, Kim JJ, Suh JP, Won YJ, Hwang KH, Oh SK, Lee JH, Chang JK, Roh JH, Lee CK, Ahn EK, and Jeong EG. A medium maturing, high quality, multiple resistant and middle plain area adaptable rice Jungsaenggold. Korean J Breed Sci 2013;45:457-462. Choi HC. Current status and perspectives in varietal improvement of rice cultivars for high-quality and value- added products. Korean J Crop Sci 2002;47:15-32. Kang JH, Kim KH, Lee DJ, and Lee YS. Evaluation and utilization of landraces in agricultural plant genetic resources. Korea: Final Report for Biogreen 21 Research Project, RDA; 2008 p. 1-382. Kim HK, Kim EY, and Jeong YP. Physicochemical properties of non-glutinous, dull and glutinous rice grain in segregating populations of dull/glutinous crosses. Korean J Crop Sci 1999;44:277-281. Hong HC, Choi HC, Hwang HG, Kim YG, Moon HP, Kim HY, Yea JD, Shin YS, Choi YH, Cho YC, Baek MK, Lee JH, Yang CI, Jeong KH, Ahn SN, and Yang SJ. A lodging-tolerance and dull rice cultivar Baegjinju. Korean J Breed Sci 2012a;44:51-56. Hong HC, Yang SJ, Lee JH, Jung OY, Yang CJ, Choi YH, Kim YG, Lee KS, Choi IS, Cho YC, Kim MK, Lee JI, Jeong EK, Roh JH, Kim KJ, Hwang HG, Moon HP, and Lee YT. A medium-maturing dull cultivar Baegjinju 1. Korean J Breed Sci 2012b;44:57-61. Hong WJ, Yoon MY, Ra WH, Park JW, Min SK, Kwon SW, Cho YH, and Park YJ. A new variety 'Jinsang'with lodging tolerant and low amylose content. Korean J Breed Sci 2014;46:103-107. Rural Development Administration (RDA). 2011 Project plan for collaborative research program to develop new variety of summer crops 2011a:25-68. Rural Development Administration (RDA). 2011 Project report for collaborative research program to develop new variety of summer crops 2011b:9-139. Shin YS, Won YJ, Ahn EK, Kim YK, Kim MK, Hwang HG, Yoon YH, Lee JH, Choi IS, Yoon KS, Oh SK, Kang KH, Shon JY, Jeon YH, and Shin JC. An early maturing, blast resistant and low amylose rice variety Seolbaek. Korean J Breed Sci 2012;44:597-601. Ise K, Akama Y, Horisue N, Nakane A, Yokoo M, Ando I, Hata T, Suto M, Numaguchi K, and Nemoto H. 'Milky Queen', a new high-quality rice cultivar with low amylose content in endosperm. Bull Natl Inst Crop Sci 2001;2:39-61. Won YJ, Shin YS, Ahn EK, Kim MK, Kim YG, Hwang HG, Yoon YH, Jeon YH, Yoon KS, Yoon MR, Lee JH, Oh MK, Jeong JM, Yang WH, and Jung KH. An early-maturing, blast resistant and semi-transparent low amylose rice variety 'Wolbaek'. Korean J Breed Sci 2012;44:379-383.